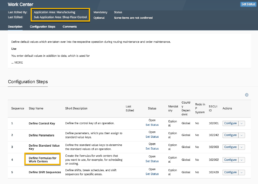 In this SAP S/4HANA Cloud Knowledge Snippet – #S4HCKS – we do a deep dive into a new Fiori Application that was released with SAP S/4HANA Cloud 1808. The app in question is Manage Work Center Capacity. You can find more information about this application in the Fiori Apps Library by following this link. You can also check out the application documentation here. If you are unsure where to start to begin exploring this application your self, then Best Practices scope item 31L – Production Capacity Planning and Evaluation– is a good start. I will let you follow the video for a detailed walkthrough of you need to do in SAP S/4HANA Cloud to be able to fully leverage this application, but before that I will just offer a few pointers, that are also discussed in the recording . This is not a must and really depends on your situation – i.e is capacity an issue and are you always juggling with the capacity of your bottleneck or key work stations. If so, then you may wish to generate capacity requirements for your planned orders already coming out of MRP, so that you have visibility over the capacity requirement of your production plan over a longer horizon, then that just provided just by the production orders (which you would have only created when needed !). If so, then you will want to execute the scheduled MRP run, with the scheduling setting ‘2’ – Detailed scheduling. This will have the effect of reading the product’s routing and not not the in-house production lead time in the material! Because you are reading the routing, it means that you are reading the routing’s work centres. Is your formula enabled to generate capacity requirements? The formula you will choose in the work centre (or create yourself) is very important, in that, if you miss the setting that will generate a capacity requirement, then you will not see any capacity in the capacity monitoring application! So make sure the ‘WKCtr for rqmts’ check box is active for your selected formula! It may be that you need to create your own formulas, to calculate the capacity requirements of your work centers using a specific formula. No problem, with SAP S/4HANA Cloud you can do that! Just head over the to the Manage your solution application, look for the SSCUI’s in the context Manufacturing / Shop Floor Control / Work Center and create your own formulas.